SEQ: RAIL Back On Track's 2017 Public Transport Passenger Survey results now available! "Since RAIL Back On Track formed in 2006 we have conducted our own annual member surveys on how members rate public transport. This year we again opened up our survey up to the public! There were 173 responses to our survey. 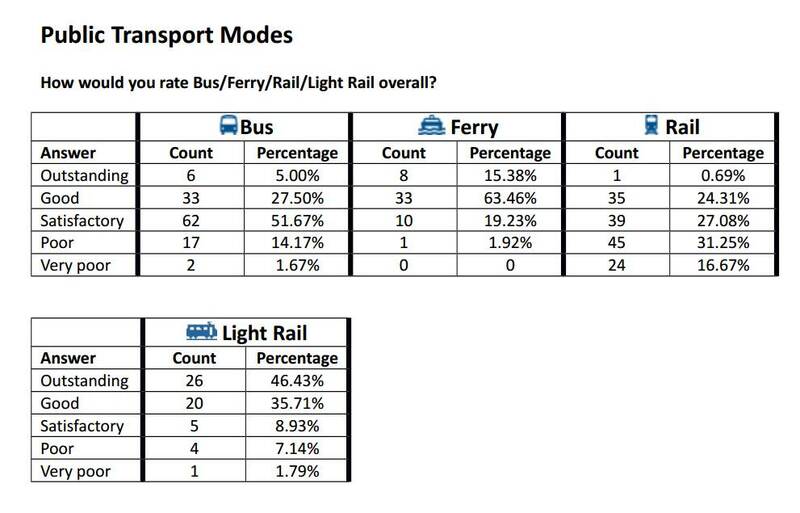 "Results of the survey, including comments, are now publicly available on the RAIL Back On Track discussion forum > https://railbotforum.org/mbs/index.php?topic=12965.msg200686#msg200686 . All results can be viewed there. 1. The public thinks the present fares overall are still too expensive. We suggest a fare price freeze for 2018 and 2019. Rail fail has had a devastating impact on the public's rating of rail overall. Ferry continues to rate well. 3. The Gold Coast Light Rail remains a standout success.